Over the last 30 years, FRAMECAD has developed an effective, practical and cost effective modern building system that produces steel buildings. Today, FRAMECAD, extends beyond the frame to offer building construction components with the launch of rated building sub-assemblies. 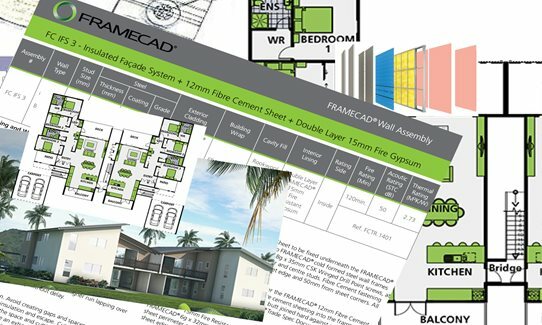 The FRAMECAD Design and Build System has been developed to enable our customers to increase revenues specifically for their construction requirements and geographic regions. "“Our building sub-assemblies enable customer to complete the building envelope, gives them an understanding of how to build a steel building using with FRAMECAD’s modern building system and ultimately increase our customers revenues, simply and easily”. says Michael Stanton Marketing Manager for Building Products.FRAMECAD building sub-assemblies have been designed by FRAMECAD engineers. All FRAMECAD Fire, acoustic and thermal testing has been carried out by our in-house experts that are world leaders in cold formed steel construction. Our building products have been extensively sourced throughout the globe and to complement this extensive design program, FRAMECAD has obtained certified assessments for all FRAMECAD building products with appropriate authorities on their likely performance. These assessments are based on test results and expert opinion.FRAMECAD are continuously developing products, systems and sub-assemblies, so for specific building sub-assemblies that you may require please contact us so one of our experts can formulate a solution for you.